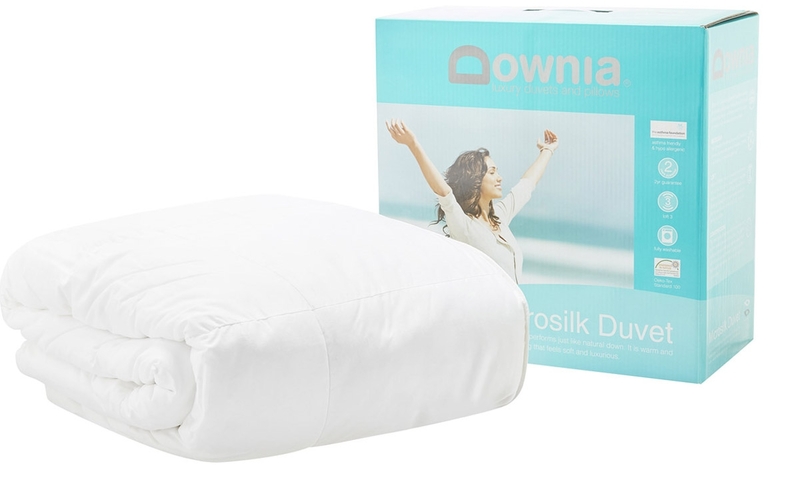 Drift off to sleep in splendor with this sumptuous Downia duvet. Drift off to sleep in splendor with this sumptuous Downia duvet. Filled with a mix of microfibre and silk, two of the softest possible materials, it lays just like traditional down. Inner walls add loft to the duvet, keeping it plush and full even after years of use. The duvet’s weight is perfect for all but the coldest months, or year-round in a climate-controlled home. The cover is crafted of fine 300-count sateen cotton, and the duvet is fully washable, so it offers the luxury you deserve with the convenience you need. Add a touch of opulence to every evening when you spread this microsilk duvet on your bed, and rest in warmth, softness, and comfort. This luxury duvet contains a mix of microfibre and silk. It is ideal for use in Spring, Autumn, Summer and warmer Winter months, and all year in climate controlled homes.